If this seems simlar to the sale I posted about two weeks ago, it's because it's practically a twin. 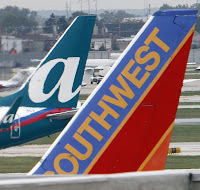 Apparently we didn't purchase enough empty seats so Southwest and AirTran are offering a new sale with flights through June 25 discounted from $63 one way. There are over 100 cities to choose from, and I don't see any travel restrictions. I'm sure weekend flights will be pretty full, so do what I do and leave early on Saturday and come back Monday. Airports are generally less crowded and seats are cheaper.